A Selbyville Middle School player fights a tackle during a game earlier this season. The team battled for four quarters but just couldn’t get the score they needed to get that final win. The Indians finished 5-1 on the season. They out-scored their opponents 132-13 in their games, for an average of 22 points a game. 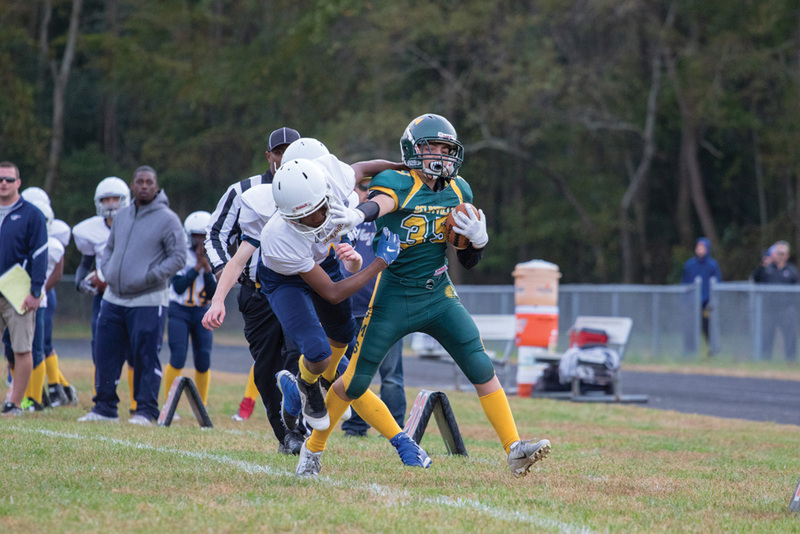 The 43-member team will see 25 players from the eighth grade head to Indian River High School next season with hopes of continuing their past two season of success — last year’s team finished 6-1. The eighth-graders include Caleb Galbreath, Ja’chi Duncan, Benjamin Cordrey, Luke West, Jacob Hess, Hayden Hall, Ashton Stephens, Alfonso Santiago, Rishon Smith, Thomas Gogarty, Maxwell Curcio, Harold Toomey, Shawn Deshner, Bryce Rickabaugh, Jonathan Johnson, Brent Townsend, Douglas Murray, Benjamin Murray, Jordan Kendorski, Hayden Davis, Scott Ciociola, Chance Hocker, Ramier Turner, Jamaal Jones and Connor Whitlock. The Selbyville field hockey team closed out its 2018 season with a 1-1 tie against Millsboro last Wednesday, Nov. 7. Kendall McCabe scored the lone goal for the Indians, while Maddie Neal made nine saves in goal. The Indians finished the year with a 5-2-4 overall record. There are only six eighth-graders moving up to IR next year, including Kendall Cathell, Jillian Collins, Jordan Gonzalez, Kinsley Hall, Isabella Scharp and Carley Topper. The SMS boys’ soccer team capped their 2018 effort with a 3-3 draw with Millsboro last Wednesday, Nov. 7, bringing their record to a close at 5-5-1. Eighth-graders moving on from the program include Connor Bird, Cole Brickman, Blake Brightman, Luis Espinoza, Caleb Galbreath, Charlie Kilby, Oswaldo Loyo Leon, Alexis Mendoza Uscanga, Evan Peterson, Nicholas Proctor-Vinuela, Luis Quevedo Acevedo, Eduardo Valdes-Trujillo and Bennett White.